You’ll find plenty of convenient parking and a well-lit parking lot. 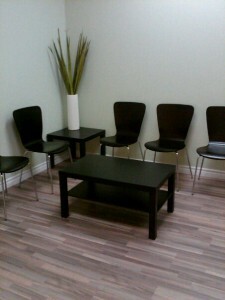 You’ll be greeted by name when you enter our practice and given a short tour to get you acquainted with our facilities. If you’ve already completed your admitting paperwork, great! If not, after doing so we’ll likely show you a short 5-minute video and then you’ll meet Dr. Sheila Keber. The doctor will begin with a short consultation to discuss your health issues and goals and to determine if chiropractic is likely to help you. If it looks promising, a thorough examination will help identify the cause of your problem. The doctor may continue with a treatment on the first visit, and she may send out for further investigations such as xrays, depending on what is revealed during your consultation and exam. If you have had any previous studies done that you think would be of interest to the doctor, please bring them along for the doctor to look at.